Wiersbe, Warren W. Real Worship: Playground, Battleground, or Holy Ground?, 2nd ed. Grand Rapids, MI: Baker Books, 2000. 222 pp. $14.99. Real Worship: Playground, Battleground, or Holy Ground? is a volume in which Warren W. Wiersbe addresses problems with worship in the church and discusses how real worship should look. Having been a pastor for almost twenty five years, he draws on personal experience in the book, while serving as preaching professor at Grand Rapids Baptist Seminary and while participating in his speaking and writing ministry. 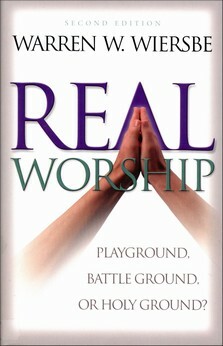 Real Worship is one of over 130 books that he has authored. In the book’s first chapter, Wiersbe reveals his thesis that worship is to be a transforming experience for believers individually and for the church collectively. He maintains that the church needs to return to real worship as defined in God’s Word. Wiersbe develops his thesis by exploring five main ideas about worship. Each chapter ends with a prayer that the reader can pray as an application of that chapter. In part one, “Invitation to Worship,” Wiersbe describes his frustration with the current state of worship in the church, posits his definition of worship, and discusses the transformation in a believer’s life that comes through worship. Part two, “Worship Involves Wonder,” explores the concept that worship requires admitting ignorance and recognizing that God is beyond our understanding. Wiersbe discusses what wonder is, wonder as it relates to God, idolatry and its hatefulness to God, what the lives of several believers in Scripture teach us about worship, and the wonder of God’s church. Part three, “Worship Involves Witness,” considers how worship is meant to serve as a witness to God, one another, and the world. This includes a discussion of preaching as worship and of the relationship between worship and the arts. In part four, “Worship Involves Warfare,” Wiersbe describes how God and Satan both desire worship and participation in worship is spiritual warfare. He describes the church as a spiritual army and discusses applications of this concept. Finally, part five explains that “Worship Involves Wisdom.” Wiersbe considers the wisdom of taking worship seriously, planning balanced worship, and incorporating tradition in worship. One of the greatest strengths of this book is its strong foundation in Scripture. Throughout the volume, Wiersbe includes lengthy Scripture passages and expounds on them. Often in works of this nature, authors will not include long quotations from the Bible for fear that readers will skim over them. The fact that Wiersbe does not shy away from quoting large portions of the Bible makes it evident that he is basing his arguments on Scripture and is not simply taking a verse here and there to support his own opinions. Another strength of the book is its emphasis on balance. Throughout the work, Wiersbe discusses the importance of striking a balance between objective and subjective aspects of worship (pp. 23-25); between witnessing to the Lord, one another, and the world (p. 95); and between regarding God as being too transcendent to be near us and regarding him as a “buddy” (pp. 178-180). This emphasis on balance is often neglected in churches today. Additionally, Wiersbe’s concept of worship as warfare brings to the discussion on worship something that is often omitted. Real Worship is important and timely because it challenges ideas about worship that are often taken for granted. It causes the reader to think about why churches do what they do, and whether or not those things are conducive to true worship. The book is written in language that is not overly academic, making it accessible to the average reader. This probably stems from the author’s experiences as a preacher. He makes use of alliteration and the book reads like a sermon. The work is especially useful as a practical guide for pastors, as Wiersbe draws on his own experience and makes applications that pastors can use in their ministry. However, it also has value for the lay person. This volume is suitable as a textbook or as supplemental reading in a worship class. It is also useful as a book for personal study. The inclusion of prayers at the end of each chapter shows that the book is meant for individual growth. It is intended to be read straight through, but could be used as a reference if a particular aspect of worship was being researched. Megan Matthews is a graduate student at Southwestern Baptist Theological Seminary.